Rihanna and Girl Scout Cookies? We’d Say That’s A “Winning” Combination! Win Tix To See Rihanna! Did you know there’s an exciting Instagram contest for your cookie customers? That’s right! Our Council is partnering with radio station 99.1 KGGI to give away a gift basket full of Girl Scout cookies, plus tickets to see Rihanna in concert! 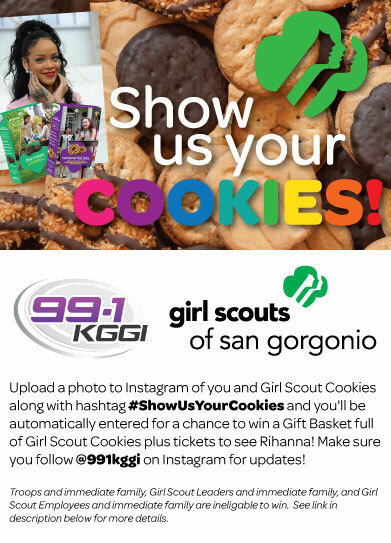 Let your customers know by printing out the flyer below and reminding them to follow GSSGC and KGGI on Instagram, oh and to post their “cookies” with the #ShowUsYourCookies. Don’t forget to tune into the 99.1 during your daily commutes, too! 1. Upload a pic of you and your #girlscoutcookies (purchased in Riverside or SB County). 4. Cross your fingers! Good luck!